The backyard space is mostly flat. The entrance to the house is on the second level, requiring a deck. There is a septic area on the right side of the yard, roughly 20 feet from the corner of the house. The yard gets full sun all day with no major wind issues. 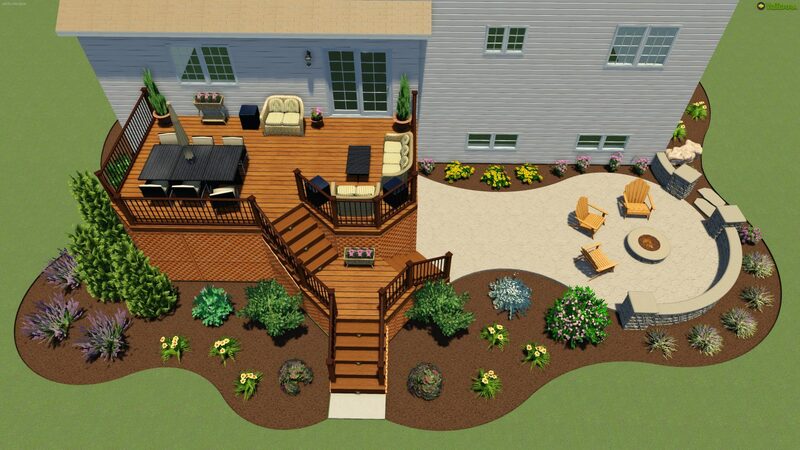 They needed a deck off the back of the house but wanted another area in the yard for a fire pit. 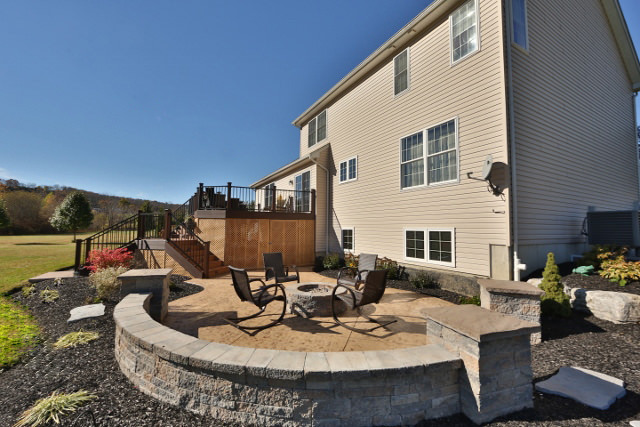 There is a play area in the middle of the yard, so access to the yard directly off the deck is a must. 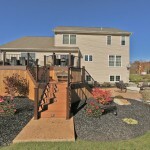 The landscaping must provide color all year and be low maintenance. 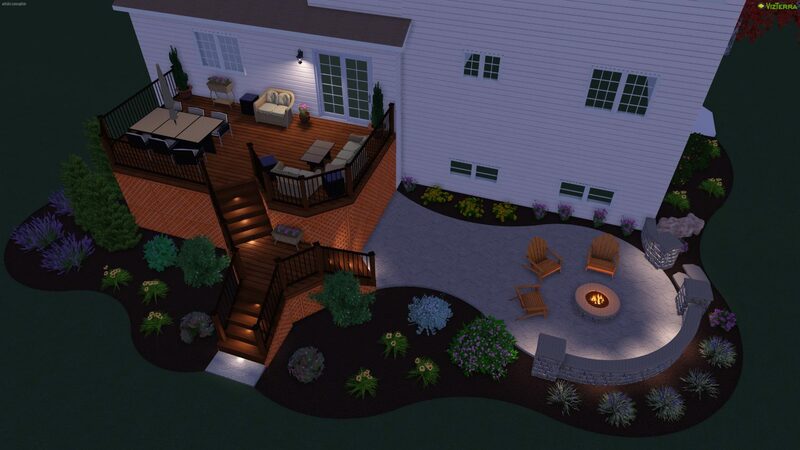 They wanted to add a landscape lighting plan to all the areas. 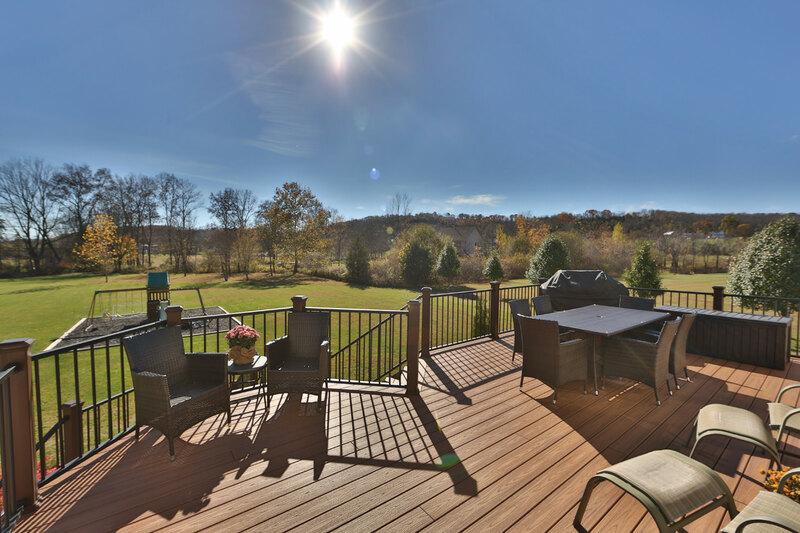 The deck sits 8′ above ground level and is large enough for two spaces. 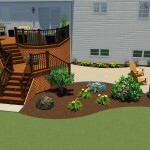 The deck was designed to allow for easy access to the yard and to another area with a Y-shaped staircase. 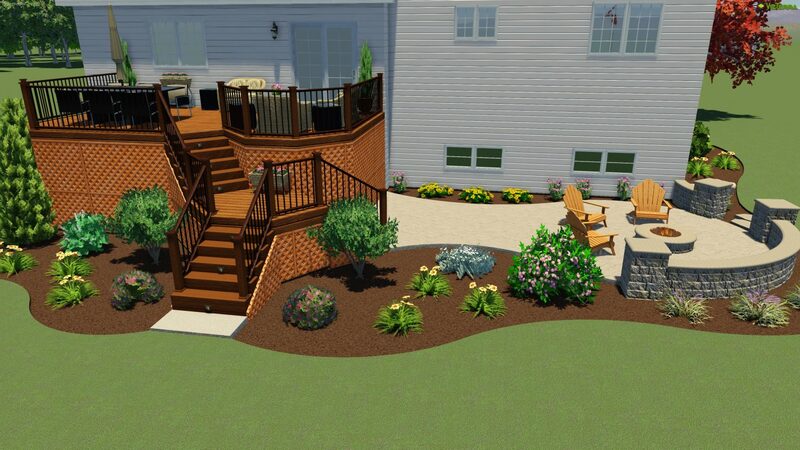 Below the top set of steps sits a landing area where one staircase leads to the backyard and the other leads to a fire pit area. 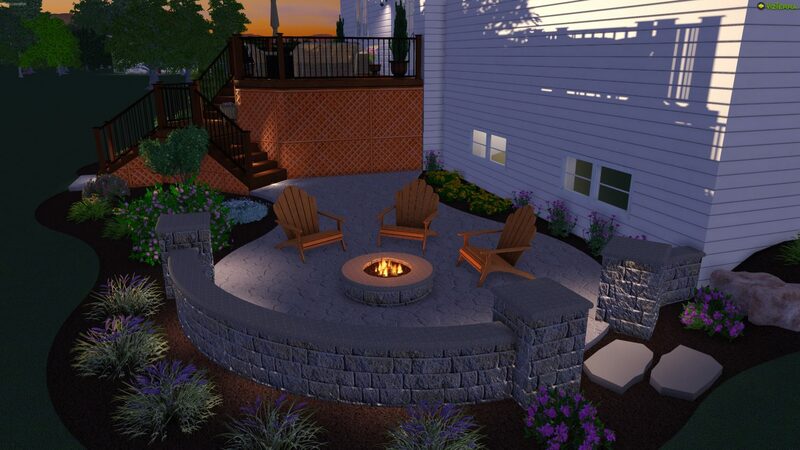 The fire pit area is encompassed with a decorative seating wall with pillars on each end. We created a gap for side entrance and continued with the wall against the house, mainly for design reasons. 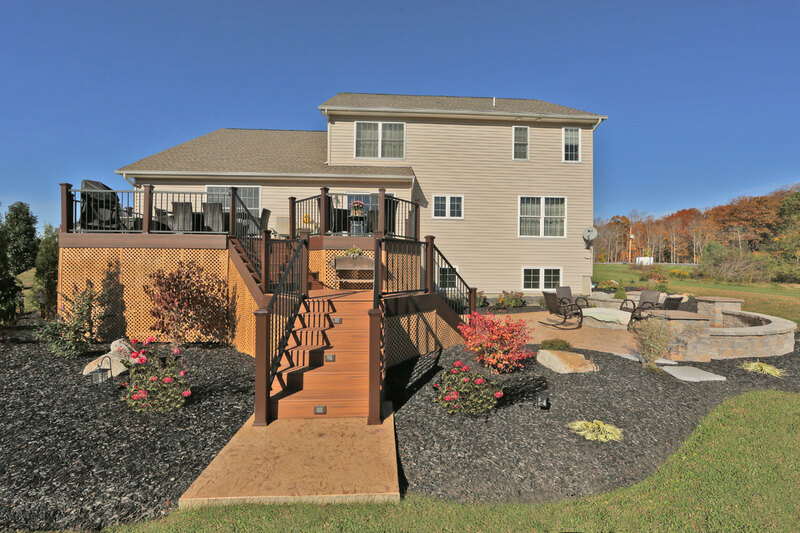 The landscaping beds were continued from the existing beds from the side of the house and create a smooth flow around the patio and deck. 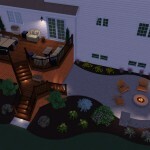 The lighting plan consisted of lights on the deck and lights in the hardscape. We added step lights on every other step as well as post lights on most of the deck posts. The hardscape lights were added to the wall and pillar entrance area. We used Trex Transcend for the decking material. The color for the floor boards is Tiki Torch. The color for the Fascia is Lava Rock. We used Charcoal Black Trex Reveal railing with Vintage Lantern posts. 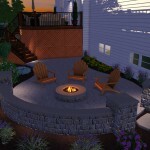 The wall, pillars, and fire pit are Techo Bloc Champlain Gray colors. 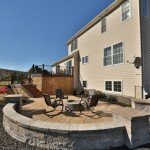 We used Mini Creta for the wall block and the fire pit is a Villagio. 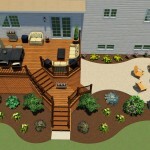 The planting material consisted of Arborvitae, ornamental grasses, hydrangea, azalea, a variety of tall, sun-loving perennials, daylily, spirea, butterfly bush, viburnum, and burning bush. The client wanted to add her own plants, so we had to create the beds large enough to fit more plants down the road.